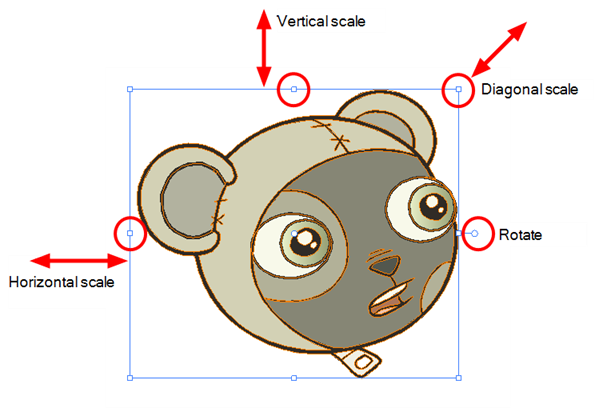 The Select tool is used to select drawing objects in the Drawing or Camera view and to apply basic transformations, such as repositioning, rotating or scaling, using the different handles of the bounding box. 2. In the Drawing or Camera view, select the drawing objects. 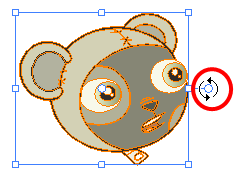 ‣ Select all the drawing objects in a drawing by pressing [Ctrl] + [A] (Windows) or [⌘] + [A] (Mac OS X). 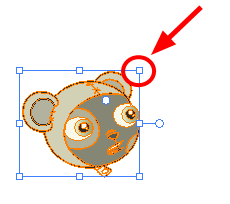 ‣ Switch to lasso selection mode by holding down [Ctrl] (Windows) or [⌘] (Mac OS X). ‣ To rotate, drag the selection box handle. ‣ To scale, pull or push the side, top, or corner control point. Hold down [Shift] to lock the scaling ratio. 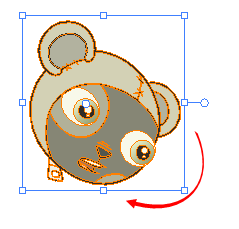 While working with the Select tool, you can hold [Ctrl] (Windows) or [Alt] (Mac OS X) to temporarily switch to the Perspective tool, allowing further transformations—see Perspective Tool. 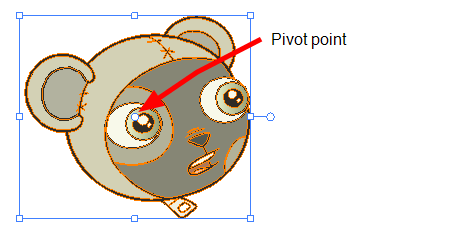 Some of the transformations such as rotation, scale and flip, are done using the position of the pivot point as the central point. By default, this pivot point is located in the centre of your selection. You can temporarily reposition this pivot point for a transformation using the Select tool. 1. 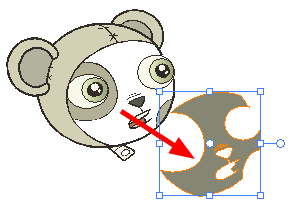 In the Drawing or Camera view, select the drawing object you want to transform.